化石講場-Fossils Board 亞洲首個古生物/恐龍/化石的華語討論區 - [古生物新聞 Paleontology News] - 現今地球物種多樣性 6,000 萬年來相若 - powered by Discuz! not necessary. 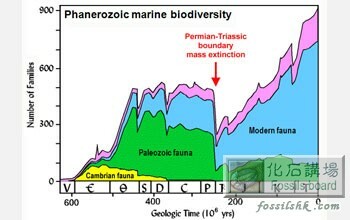 actually, there is biodiversity variation through time in marine fauna and the number of families seems to increase gradually beside the mass extinction period when the biodiversity plummeted.